Late post! Is anyone else so glad it’s finally Spring?! I saw so many beautiful flowers today, and think I might even have a twinge of a sunburn. I saw and hugged and chatted with this fantastic nurse today. I’m sure all of you have one similar in your lives. I want to hear their stories! Three weeks left to send! I think you will like her, and the “entrepreneurial” spirit she exhibits. What fun we’ve had together these last seven days. I’ve introduced you to nurses from small cities, nurses on the Federal level, living legend nurses, author nurses, and real-life working nurses. So many nurses, so much innovation! And we still have three more weeks of chatting left! I’m feeling happy tonight. I spent the day with family in the sun, celebrating Spring, new life, babies and being together. Now, the train back to my city feels relaxing and familiar, and I’m looking forward to joining friends on rooftops when I get in shortly. So, since it was a party-filled day, and will likely be a festive night, I’m keeping things casual. I want to introduce you to a nurse innovator that I look up to and love very dearly. She’s not only brilliant, she’s been at my side through every step of my nursing journey. I got the rare opportunity to see her today, and I can’t think of anyone more creative to tell you about tonight. 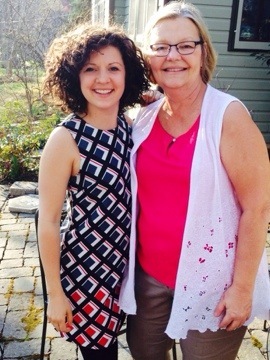 This is me with my Aunt Annie, who is an advanced practice psychiatric nurse counselor. She knew she wanted to be a nurse since the age of 12, worked the floors for a few years, and then went to University of Michigan for her master’s. Today, while catching up on a sunny patio surrounded by forsythias, she told me she can honestly say that what she does now she truly loves and feels called to. Even before I knew what nursing was, or heard it calling my name, my aunt has always been a creative innovator. She’s a talented professional, to be sure, but she’s also an accomplished glass artist, an amazing photographer, and a serious foodie. She’s widely traveled, well read, active in her community, and the most generous person I know. Lest you think I am simply applauding nurses I know and love (I am, a little), let me tell you why this makes her deserving of your “love for innovation” award: Because she used nursing to give her a well-rounded life. She found her niche, sought after it, and created a business she not only enjoys but uses to help others in profound ways. Countless nurses are entrepreneurs with their profession and with their lives. The flexibility and wide range of specialization options in the profession gives every nurse a chance to diversify their experience. Some do, many don’t. My Aunt Annie has always been on the cutting edge of her craft – nursing as well as life. She deserves every award in the universe, in my humble opinion, but a Google Doodle would do for Nurses Day.